The journey of finding a Caregiver can be exhausting and filled with endless questions or concerns. It is not uncommon for people to be unaware of all the available options for their family and loved one. No matter if you are in the beginning stages of your search or your loved one needs home care assistance at this very moment, you can trust 24 Hour Home Care to be your most trusted source of advice, information, and a shoulder to lean on during this trying time. In-home care allows seniors to continue to age peacefully and safely in the comfort of their own home. Our office has been leading the way in non-medical in-home care in the Plano area for the past several years. 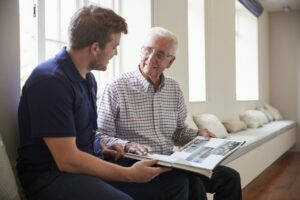 We pride ourselves in taking a unique approach to in-home care by blending innovation and technology with our exceptional customer service experience, with 24/7 accessibility and Signature Specialty Training’s to work with patients that may have Alzheimer’s, Dementia and other illnesses or diseases.Before starting senior services with our company, we will send out a team of Care experts to perform a free in-home consultation where they will analyze and asses your loved one’s current situation. After our analysis is completed, we will collaborate with your family and will create different potential senior home care solutions tailor-made to accommodate your loved one’s health needs, schedule, and personality. Our unique combination of world-class customer service, American innovation, and cutting edge technology has allowed the Dallas office to produce a level of senior home care not found anywhere else in Plano! Don’t wait another minute and contact (214) 346-5343 to change your loved one’s life forever today!